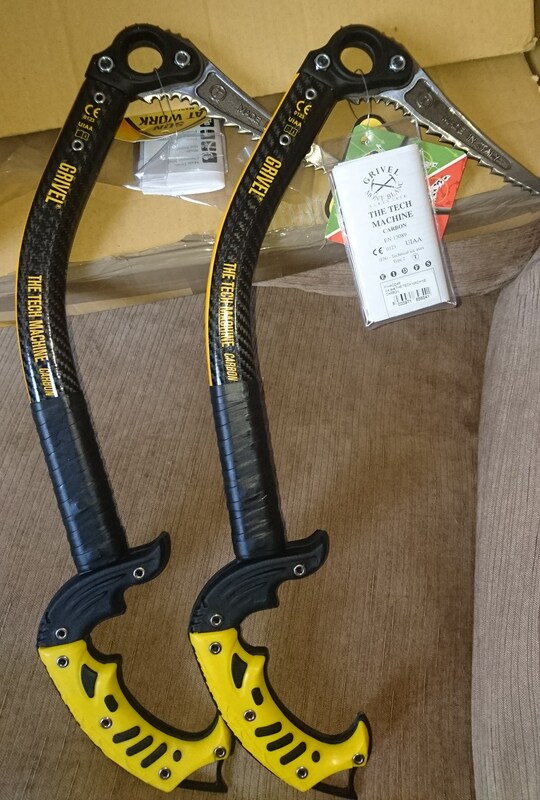 I have been lucky enough to receive a pair of Grivel Tech Machine Carbon Ice Axes to review. 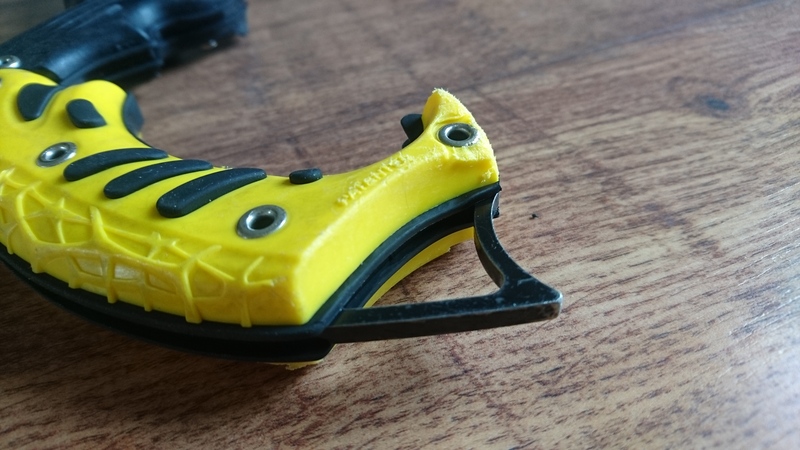 The awesome looking carbon fibre climbing tool looks brilliant for Scottish Winter Climbing, so I couldn’t wait to put them to the test. Weighing just 612 grams per axe they feel light but nicely balanced in the hand. The carbon fibre wrapped alloy shaft is not just lighter than the (yellow) Tech Machine but stronger too. 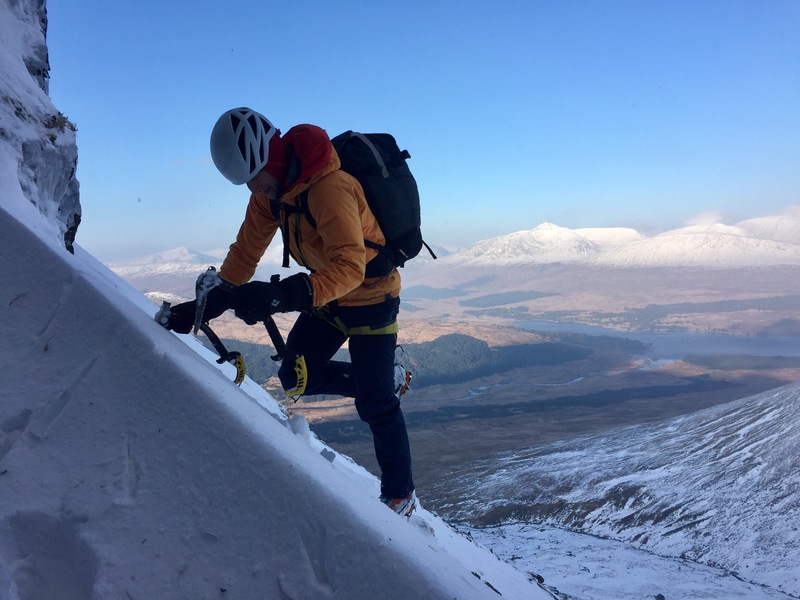 The carbon fibre also retains heat much more efficiently than alternatives making this an ideal ice axe to use on continental ice routes aswell as Scottish mixed. Grivel have used what they call G-Bone construction along the shaft which is basically a groove that allows a better grip above the handle. It is streamlined allowing it to fit into narrow cracks to reach placements and feels ergonomical at 49cm in length. 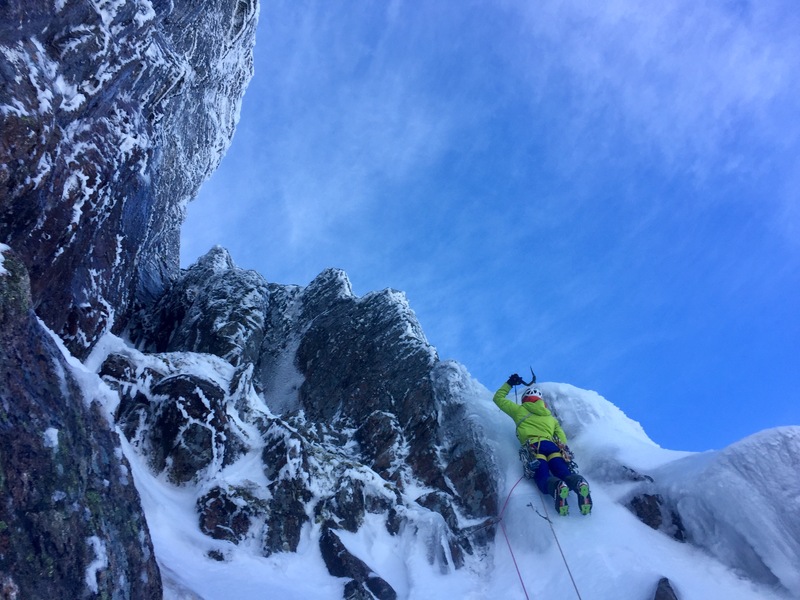 Here’s the really great bit and a major advantage over the Petzl Nomic for Scottish Winter Climbers – the head is double riveted as is the handle meaning these tools can be used for what they are built for. 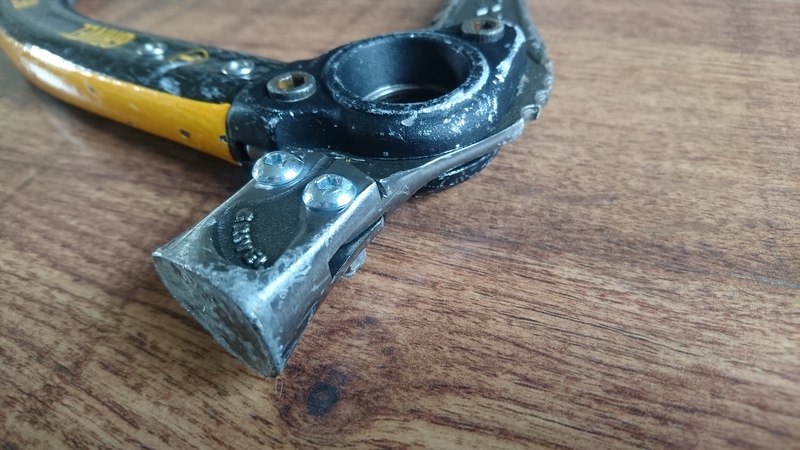 Its no secret the heads of Petzl Nomics can become wobbly due to the single rivet construction, well you can use and abuse the Tech Machines as you please, they feel bombproof! At the head of the axe is a large hole, ideal for securing the axe to your harness or pack especially with gloves on when things become fiddly. The ‘Ice Blades’ that came with them (3mm at tip) are made out of Chromoly Steel; a material that is used to produce things such as race-car roll cages and tubing for racing bicycles. It has the advantage of being exceptionally strong yet reasonable lightweight. 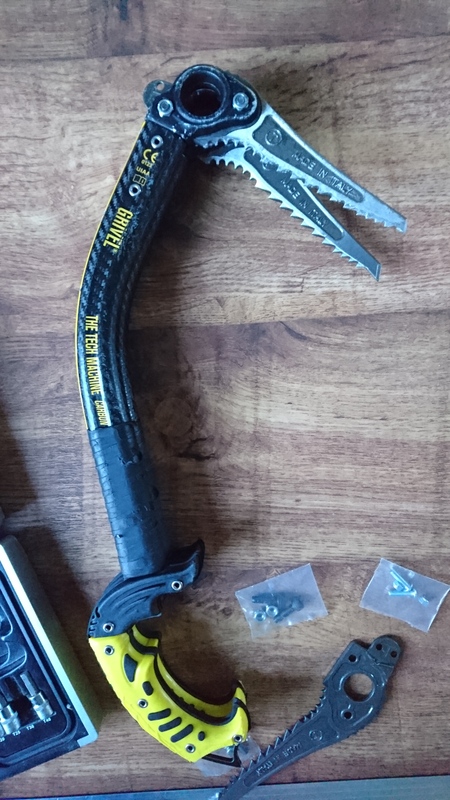 I used the Ice Blades for a few routes but decided I needed a hammer for mixed climbing so replaced them with Grivel’s Mix Blade (4.2mm at tip) which are necessary to customise with a hammer or adze. One notable difference in the two picks is the drop angle. 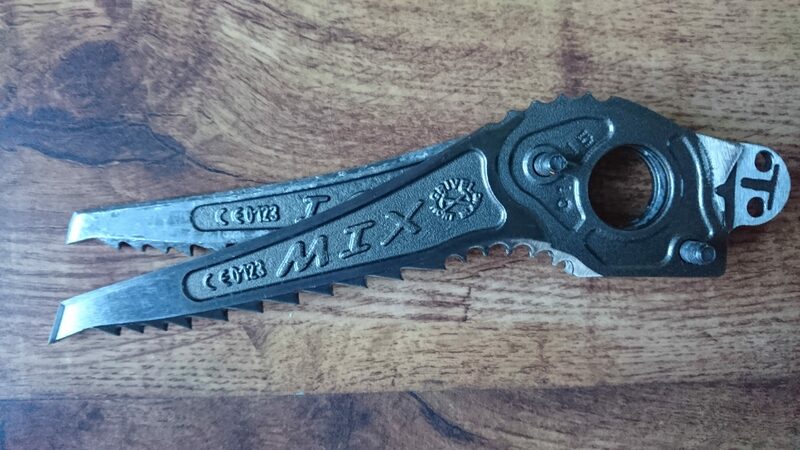 The Mix Blade is significantly more aggressive which is brilliant for hooking on steep mixed but on water ice became a little harder to penetrate. A possible solution to this is the Ice Plus Blade which although I have not tested has the additional attachment for the hammer/adze without the aggressive angle. The handle is again double riveted to the shaft for strength and I find it as comfortable as any axe I have previously used. My hands are medium sized used with gloves such as the BD Punisher or Mountain Hardwear Hydra Lite the handle is snug and responsive. I would describe it as on the thin side of average but secure whist hanging on steep routes. 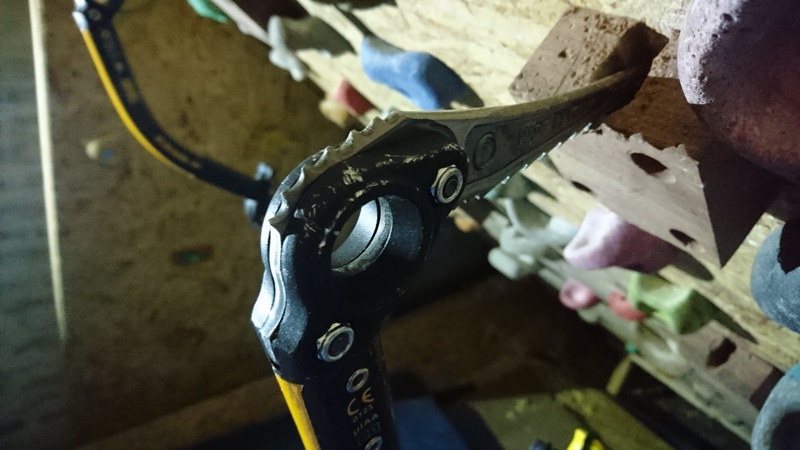 Big advocates of very hard drytooling may find the index finger mould on the handle a disadvantage but even whilst using stein pulls at a dry tooling wall I didn’t find it uncomfortable or irritating. Constructed of duel density foam and rubber, it also has a large spike to clip lanyards and carabiners to. 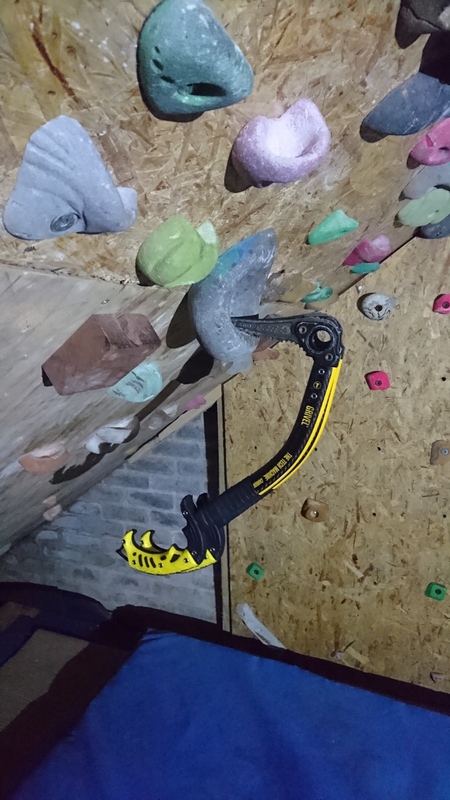 I’ve used the Tech Machine Carbon axes on mid grade ice and steep mixed routes. On ice, the swing is brilliant but they really perform at their best on steep ground where the aggressive angle clears bulges readily whilst hooks and torques felt secure and accurate. I’m struggling to find something I don’t like about these axes but I suppose a retail price of around £250 per axe will put some off, and if it does I recommend the Tech Machine which are cheaper, slightly heavier but mechanically the same axe with a slightly different balance. As you can see I haven’t just took them out the box and written my observations. This review is based on practical use on various ground from grade III ice to VII mixed. 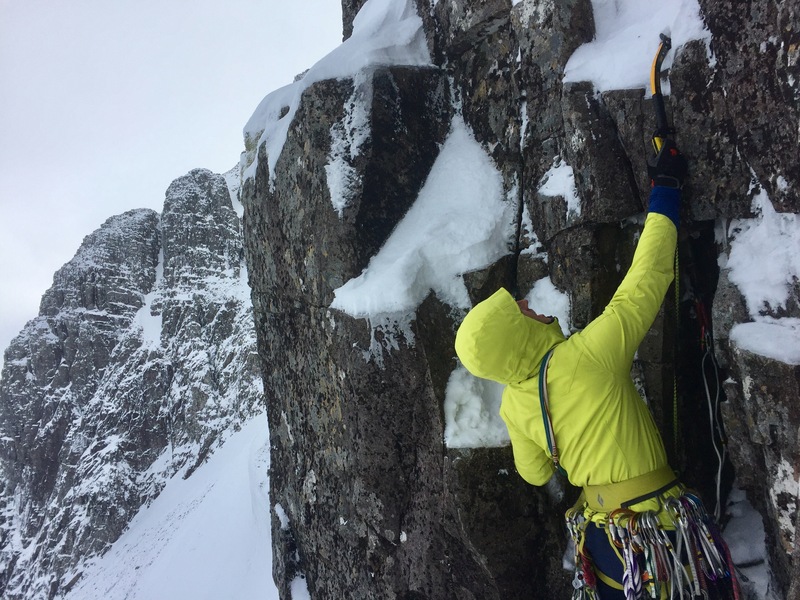 For Scottish winter climbing I feel there are few better options – well done Grivel!